Stunning custom home overlooking the gorgeous Lake Purgatory! Take in amazing views from every room in the house. Hike down to the trout-filled lake from the incredible wrap-around deck. And enjoy evenings under the stars in the picture-perfect hot tub nestled in a forest of Aspen trees and Evergreens. While you'll never want to leave this mountain gem, you're just minutes to Purgatory Resort and some of the best skiing and hiking around. As you enter through the front door and walk up a few stairs, you're greeted by a warm and open living space. The family room features a dramatic stone fireplace, vaulted ceilings and a wall of windows so you can view the mountains and the lake at all times. Living room furnishings include leather couches, recliner and large coffee table—perfect for game night. There's also a Smart TV (bring your NetFlix and Hulu credentials and pick up where you left off), WiFi and cabinet full of games. Satellite TV subscription as well. Next to the living room and centered in the house is the custom kitchen, featuring granite countertops, gas stove/range, toaster oven, griddle, toaster, crock pot, coffee maker, pots, pans, dishes and all your cooking essentials. The dining area is furnished with Pottery Barn table, chairs and bench, and windows that face the north with great views of Engineer Peak, almost 13,000 feet in elevation. Additional seating can be found at the bar stools. The master bedroom is located on the main floor and has its own private door to access the outdoor deck. Views from all rooms are exceptional, but the master is particularly great. The corner room gives you views of the trees, lake and mountain peaks. There is also a twin size trundle bed tucked underneath the master bed. The master bathroom features a deep soaking tub, double sink, and separate walk-in shower. Head upstairs and you're welcomed by a large loft with a sitting area and small office work place. Not that you'll want to work, but if you have to, this is just the spot. The loft opens up to the living room and that fantastic wall of windows. Also upstairs is a TV, DVD player and assortment of DVDs. Perfect for a kids' movie night! Also upstairs are two bedrooms and a full bathroom. The first bedroom includes a queen size bed and walk-in closet. The second bedroom is a bunk room with two sets of bunk beds. The bunk room can sleep 4 and also features a large walk-in closet. Additionally, there is a full sized washer/dryer on the main floor and separate mudroom downstairs. Since this property is right on the lake, there is a canoe at your disposal. It is Colorado state law for anyone under age 16 to have a life vest on (also available to you). Take some fishing poles with you and try your luck at catching some trout! Please catch and release. During the summer months, there is a teak table and 4 chairs on the deck so you can enjoy all the views of Lake Purgatory and the San Juan mountains. The family-friendly Purgatory Ski Resort is just 1.5 miles down the road. Winter activities include skiing, tubing, dog sledding, snowshoeing, sleigh rides, snowmobile adventures and more! Summer activities include hiking, mountain biking, canoeing, kayaking, alpine slide, zipline, scenic chairlifts, summer tubing, and the new mountain coaster. Land line available in the house in case cell phone coverage is spotty. Unlimited domestic long-distance available at no additional cost. In the event your schedule changes, full refunds are offered up to 60 days from your arrival then 50% if cancelled 30-59 days from arrival. No refunds if cancelled within 30 days of arrival due to our inability to rent it out in such a short time frame. There is also a $500 deposit which is refundable upon final inspection after your departure. Additional terms and conditions will be provided upon booking. My family and I love to travel the U.S. in our travel trailer, but my favorite spot is in the San Juan mountains surrounding this house. This is our family's vacation home with many great memories. Hot tub overlooking the lake with the mountains in the background. Basic condiments and spices are provided. My family (3 boys) enjoyed our stay at this beautiful warm cabin, hated to leave. Hospitality was 5 stars so well stocked and comfortable. Great place to stay, everyone was comfortable from the minute we opened the front door. There was nothing we needed once we got there, just look around the house and you will find it. Honestly couldn’t have needed anything more!!! Our amazing vacation was hugely due to this beautiful home! Our two families were very comfortable in this space. Best part was soaking in the hot tub after a day of skiing and staring at the thousands of stars. The kids loved sledding and tubing down the hill right outside the back door—lots of wonderful memories were made. We got lots of snow so highly recommend your vehicle is 4x4 with snow tires or chains. Otherwise, you won’t be able to get up the driveway. Purgatory ski resort is practically across the street and Durango is a quick 20 minute drive. Visited the Nugget Bar across the street from the neighborhood—great locals spot with yummy food truck (try the fried green tomato and crab cake sliders!). Jonathan did a great job checking up on us and was always quick to reply. The property owners were quick to respond as well. We even left something behind and the they are shipping it to us. Thank you for such a great time!!! Beautiful home in the lake. What a great place to reconnect with family. Thanks Dave for making this home perfect for reconnecting with our Australian relatives. The hot tub at night with the snow lit trees was magical. Our kids skiied and snowboarded at Putgstory and to say that it was less than a 5 minute drive is not an exaggeration. We also took the beautiful drive to Silverton for lunch and discovered Ice Pirates. Our last day was spent snowmobiling with them and enjoying the “out of this world” scenery. The bbq at the house met my brother’s high standards and we got great supplies from the gourmet supermarket just outside of Durango. We couldn’t have asked for a better trip. Our only regret was that we couldn’t stay longer!! 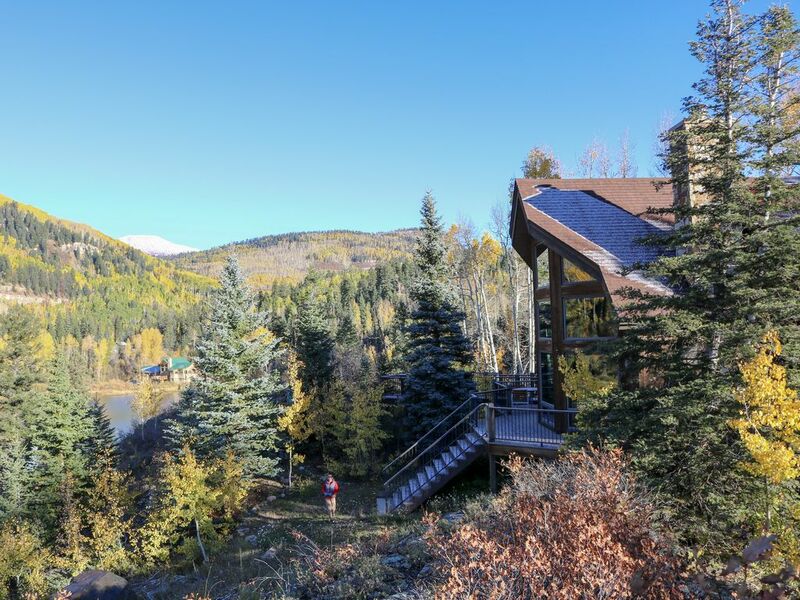 Beautiful property, very close to Purgatory Ski Resort. Highly recommend. The property is beautiful and a perfect place for a little family getaway or getaway with a few friends. We went in winter and the house is very convenient for skiers/boarders (less than a mile from the mountain). Dave, the owner, was very responsive and helpful any time we needed him. I would love to go back in the summer being that Dave left several recommended hiking trails and even leaves you a canoe to go out on the beautiful lake the home rests on. This is a perfect little getaway for all ages. Our family more than enjoyed ourselves at this cabin. We were looking for something away from towns, a beautiful scenery background...alone. We found it with this cabin. Gorgeous views and amazing trails to walk among. The house was filled with all amenities, trash bags, paper towels, bath towels, dish soap and sponges, coffee maker, all the bed/bath linens, and laundry pods. Fires in the fireplace nightly and a few hot tub dips. This place is perfect for a family or two looking for a gorgeous cabin with peace and privacy, yet still near a town for amenities.